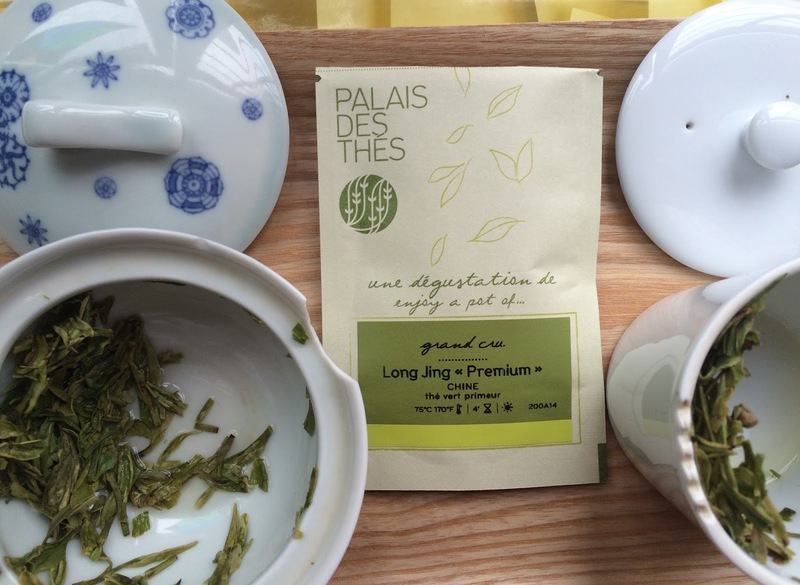 I very much enjoyed the grand crus oolongs released by Palais des Thes last year so I was eager to try the company's new grand crus greens. I received a packet each of Long Jing Premium and Tawaramine Shincha Ichibancha. Neither packet of tea was vacuumed sealed and I think this negatively impacted the aroma and flavors of the teas. The Long Jing, pictured above, has the classic leaf shape and color, however the aroma of the dry and steeped leaves was underwhelming when prepared in a tasting cup. The flavor profile of the Long Jing liquor improved when I prepared a pot of the tea using the remaining leaves in the packet. The photo above shows the second 4-minute infusion which had lingering vegetable (maybe bean sprouts) and mineral flavors. The Tawaramine Shincha is grown by well respected tea farmer Mochizuki Shoji. The tea leaves are beautiful and delicate and their aroma was closer to what I expected - warm sweetness and cream. On the second infusion, lime zest and seaweed flavors emerged alongside an astringent note. I steeped the entire packet in a glass pot. Of the two grand crus greens, I preferred the Shincha. I highly recommend making a pot of the Long Jing versus steeping the tea in a tasting cup or gaiwan.The Long Jing Premium is $90 per 3.5oz and the Shincha is $115 per 3.50z. Thank you to Fraiche PR for providing both teas for review.